The Human Genome Project has provided a vast amount of molecular genetic information for the analysis of normal and diseased genes. This new information provides new opportunities for precise diagnosis, assessment of predisposition and risk factors, and novel therapeutic strategies. At the same time, this constantly expanding knowledge base represents one of the most difficult challenges in molecular medicine. For monogenic diseases, nearly 2000 human disease genes have thus far been identified. Most of these conditions are characterized by large mutational variation and even greater phenotypic variation. In nephrology, several genetic diseases have been elucidated that provide new insight into the structure, function and developmental biology of the glomerulus, tubules and urogenital tracts, as well as renal cell tumors. Great improvements in the diagnostic resolution of genetic disease have been achieved, such that single base pair mutations can be readily detected. Because of accurate diagnosis and risk assessment, genetic testing may be valuable in improving disease management and preventive care when genotype-specific therapies are available. Moreover, such testing may identify de novo mutations and potentially aid in understanding the disease process. This review summarizes recent advances in the renal genetic database and methods for genetic testing of renal diseases. Medullary cystic kidney disease (MCKD) belongs with nephronophthisis (NPH) to the NPH-MCKD complex, a group of inherited tubulointerstitial nephritis which share some morphological and clinical features. Juvenile NPH, the most frequent variant of the complex, is a recessive disease with onset in childhood leading to end stage renal disease (ESRD) within the 2nd decade of life. The most frequent extrarenal involvement is tapeto­retinal degeneration. MCKD is a less frequent disease with dominant inheritance; it is recognized later in life, leading to ESRD at the age of 50 years, and may be associated with hyperuricemia and gout. In an early phase, both NPH and MCKD are pauci-symptomatic, major signs being confined to polyuria. Later in the course, clinical findings are related to the progressive renal insufficiency, such as anemia, uremic symptoms and, in NPH, growth retardation. On renal ultrasound, the kidneys present an increased medullary echogenicity with diminished cortico-medullary differentiation. 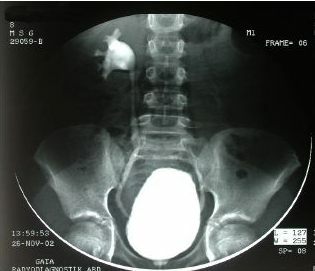 Renal cysts may be present, usually at corticomedullary boundary. 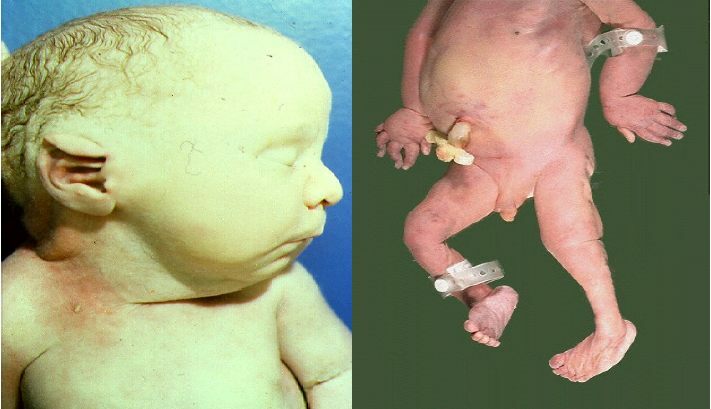 Due to the clinico-pathological identity, the two diseases were considered to be a single disorder, and the compromise appellation of NPH-MCKD complex was suggested. This unifying conception was subsequently refuted following the identification of MCKD dominant families. The recent advances of the molecular genetics changed the traditional classification of NPH-MCKD complex. The majority of cases of juvenile NPH are due to deletion of the NPHP1 gene on chromosome 2q13. Genes for infantile and adolescent NPH have been localized to chromosome 9q22-q31 and 3q22, respectively. A new locus, NPHP4, has been recently mapped on chromosome 1p36. Two genes predisposing to dominant MCKD, MCKD1 and MCKD2, have been localized to chromosome 1q21 and to chromosome 16p12. Moreover, a gene for familial juvenile hyperuricemic nephropathy (FJHN), a phenotype very similar to MCKD, was mapped to 16p12 in a region overlapping with the MCKD2 locus. The proof of the allelism between MCKD2 and FJHN has been recently provided by the identification of four novel uromodulin (UMOD) gene mutations, segregating with the disease phenotype in three families with FJHN and one with family with MCKD2. These data provide the first direct evidence that MCKD2 and FJHN arise from mutation of the UMOD gene and are allelic disorders. Cystinosis and cystinuria, both recessive genetic disorders, are fundamentally different in their pathophysiologic mechanisms. Cystinosis is a disease of cystine storage in which the kidney is the initial, but not the sole target organ. Cystinuria is a disease of renal tubular cystine transport in which excessive loss of this insoluble amino acid causes precipitation at physiologic urine pH and concentration. The former disorder uniformly results in the need for renal allograft despite recent advances in medical therapy. Cystinuria has a variable severity of expression and may be amenable to long-term medical treatment in some patients. Others may have frequent stone recurrence and infection and progress to chronic renal failure in the long term. It is the purpose of this review to provide the reader with an understanding of the respective diseases and the reasons for the differences in their prognoses and long-term outcomes. Recent advances in molecular biology have provided new insights into the pathophysiology and genetics of cystinuria. It is expected that future development will be based on molecular and gene therapy. Until then, the therapy in cystinuric patients remains a difficult task and the goal should be the prevention of recurrences. This can be achieved by full compliance with medical regimens that result in significantly reduced urinary cystine excretion and good long-term prognosis in most patients. Such measures include urinary alkalinization with potassium citrate, modest reduction of dietary sodium and maintenance of a daily urinary volume of about three liters to prevent stone recurrence in adult cystinuric patients. The use of life-long pharmacological agents with disulfide chelators should be reserved for patients who fail the general conservative therapy. Invasive surgery should be used only minimally so as to preserve renal anatomy and function. However, repeated episodes of obstructive uropathy, frequently complicated by infection may eventually result in the need for nephrectomy, and are significantly associated with development of chronic renal failure. In the Arab World we lack properly designed epidemiological studies on renal stone-disease in general, and the cystine stones in particular. We recommend a multi-center study to determine the incidence of the disease and a molecular genetic analysis of cystinuric patients and their relatives, to determine the different mutations in our population and the types of the disease both the homozygotes and the heterozygotes. Familial Mediterranean Fever (FMF) is a genetic disorder frequently diagnosed among the Arabs. It is also prevalent among Jews, Armenians and Turks. The clinical picture consists of febrile and painful attacks such as joint or chest pain that differ in quality across patients and even within the same patient. The gene responsible for FMF, MEFV, has been cloned and mutations were identified within its coding sequence. It encodes a protein that is expected to be a down regulator of inflammation. The major renal involvement in FMF is the occurrence of amyloidosis that primarily affects the kidneys causing proteinuria and ending in death from renal failure. It can be treated by dialysis and renal transplantation, but can be prevented by a daily regimen of colchicine. Other renal manifestations of FMF are discussed. The inherited hypokalemic tubular disorders are frequently summarized under the heading "Bartter syndrome" since they shareseveral clinical and biochemical findings such as renal salt wasting, hypokalemic metabolic alkalosis, normal blood pressure despite hypereninemic hyperaldosteronism and hyperplasia of the juxtaglomerular apparatus. However, careful characterization of the clinical phenotype and the correlation with the underlying molecular basis justifies the differentiation into at least four distinct disease entities: (i) the hyperprostaglandin E syndrome or antenatal variant of Bartter syndrome (HPS/aBS), which is caused by mutations in either the Na-K-2Cl cotransporter or the potassium channel of the medullary thick ascending limb of Henle's loop; (ii) the HPS/aBS with sensorineural deafness which results from inactivating mutations in the Barttin beta­subunit of the renal chloride channels; (iii) the classic Bartter syndrome caused by mutations in the chloride channel of the distal nephron; and (iv) Gitelman's variant of Bartter syndrome which is caused by mutations of the Na-Cl cotransporter of the distal convoluted tubule. This review will summarize the clinical characteristics of these diseases and the progress recently made in the identification of the underlying molecular defects that will hopefully add to the current knowledge of the pathogenesis of these diseases.